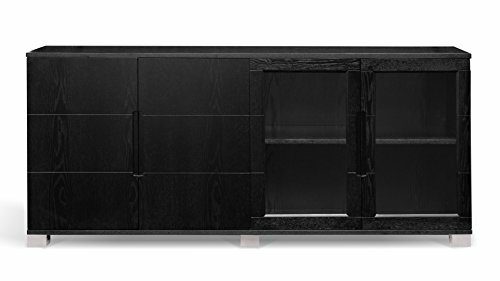 The Hayes modern cabinet is extremely versatile and may double as a credenza, contemporary storage unit or a buffet for any elegant living or office space. The spacious unit is divided into two double cabinets, one with solid doors and the other with clear glass doors framed in wood. Inside there are height adjustable shelves on either side. The dual sides are great for displaying books and keepsakes on one side while hiding extra paperwork or supplies behind the other. The finish is a black stained open grain Russian oak veneer with silver painted wood feet that coordinate perfectly with the Ford and other collections in black oak too. W 72.5" x D 16" x H 31.5"
If you have any questions about this product by Zuri Furniture, contact us by completing and submitting the form below. If you are looking for a specif part number, please include it with your message.